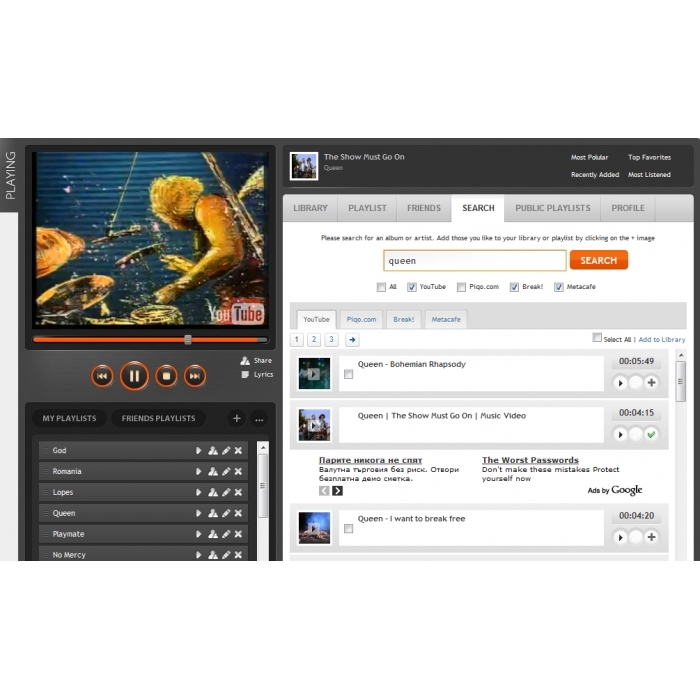 Next generation video search engine with playlists, interactive web player, download and convert videos, video libraries and much more. Searching movie clips into different sources like YouTube, Meta Cafe, Break or Piqo.com user libraries. Just type in a keyword(s), select source(s) and hit Search. Watching the movies and even more! You can watch in Full Screen Mode (which usually is not available in other sites using YouTube functionality). 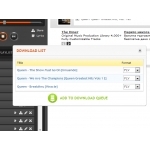 Users have their own libraries where they can add movies and create play lists. Creating a play lists with a single click, making them public or not. There is a random chance users to see your play list on the first page if you made it public. 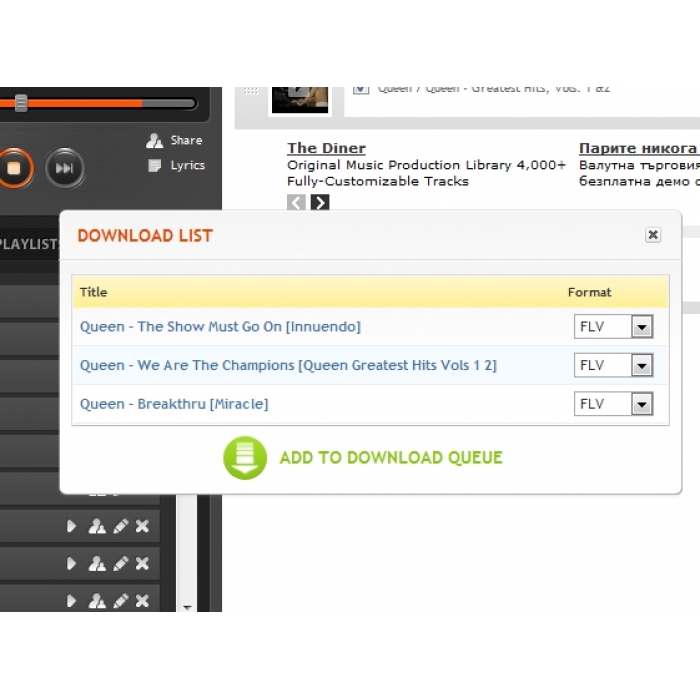 Import play lists from YouTube, Meta Cafe or even iTunes library with just a few clicks. Click on 'Import' button (the one with three dots at the right of the add play list button) and choose the method from tabs (YouTube, iTunes or other). Share information with other users or friends with the power of about 30 social networks (Facebook, Twitter, Bebo and a lot more). If you click 'Share' button on play list or select 'Share' from movie clip menu a window will open and will offer you different methods for sharing like direct link, emailing, recommend to your friends (users from Piqo) and a great variety of social networks to choose from. Limited number of searches for guest users and unlimited for registered. If user doesn't have registration then he cannot search more than 5 (five) times. Quick registration form with just few required fields. Easy to use profile system. Pages with most popular, top favorites, recently added and most listened videos so you can always check what others like. Ability to register for free - quick and easy. Unlimited plays of every movie clip you find from search, public & friends play lists or shares. Limited number of searches (only 5 at a session). Sharing information with direct link, email or about 30 social networks and blogs e.g. Facebook, Twitter, Bebo and much more with just a few clicks. Direct links to a movie clips or play lists so you can copy and send them by Skype or SMS. Interacting with rating of the movie clips - users can give their positive or negative vote for a movie clip. This will affect movie rating in top favorites pages. Browsing public play lists from people who share their play lists with everyone (made them public). Random play lists at page load will provide you with fresh content each time you open the player. Recently played movies by users. Pages with most popular, top favorites, recently added and most listened videos is great if you want to check what users like or add. Profile is the place you can change your avatar photo, password and personal info. Also you can set a description of yourself along with privacy status (private or public). If your profile is private it won't show in profile search results. Top profile panel with info like your name and description/mood and queue manager. Queue manager a.k.a. download manager is the place where you put movie clips, set desired media format and after awhile download them to your computer. You can also download multiple files at once with our download applet. Download manager can convert movie clips to AVI, WMV, MPEG4, MP3, 3GP, MOV and original FLV media formats so users can have their video clips the way they want them without additional editing and converting. Unlimited number of searches in multiple sites simultaneously which is one of the best features in this player. Also we will update search engine to support more sites in the future. Just type in your keyword, select where you want to search and hit search button to get a lot of results. Library is your personal movie clip database where you can save movie clips from searches, friends' public play lists and other users choices. Later you can put these movies into play lists (one movie clip can be in more than 1 play list). Library has filters by letter or genre which are located at the top of the movie clip list. With a single click you can get what you need. Ability to play everything from your library by clicking a button Play. Add multiple movie clips to your library by selecting them from a search result. Operate with multiple movie clips like send them to download queue or delete them from your library/play list. Track library changes and get movie clip info with RSS feed so you can share the link with others. Sorting movie clips inside play lists just by dragging them with your mouse up or down. Two play modes in your play list - play and shuffle play. 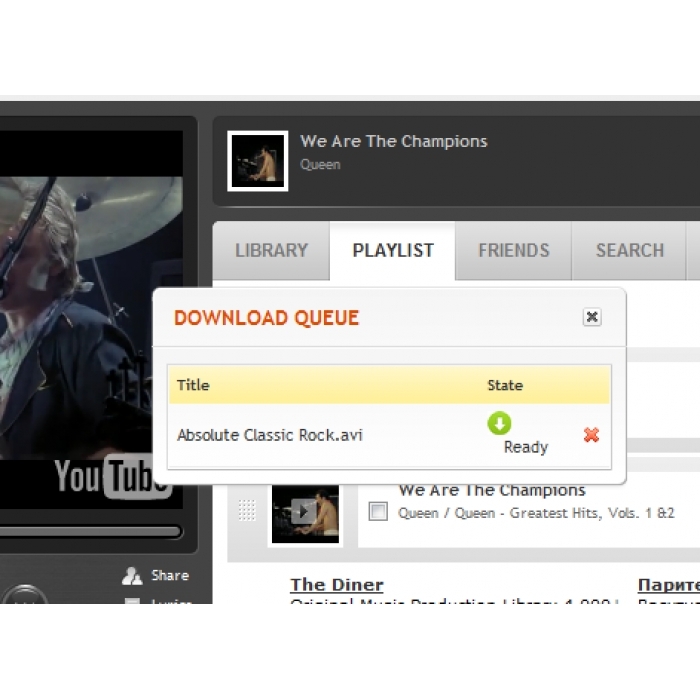 Quick access to yours and personal and friends' play lists at the left part of the screen under the player. More friends you have - more play lists you'll have. 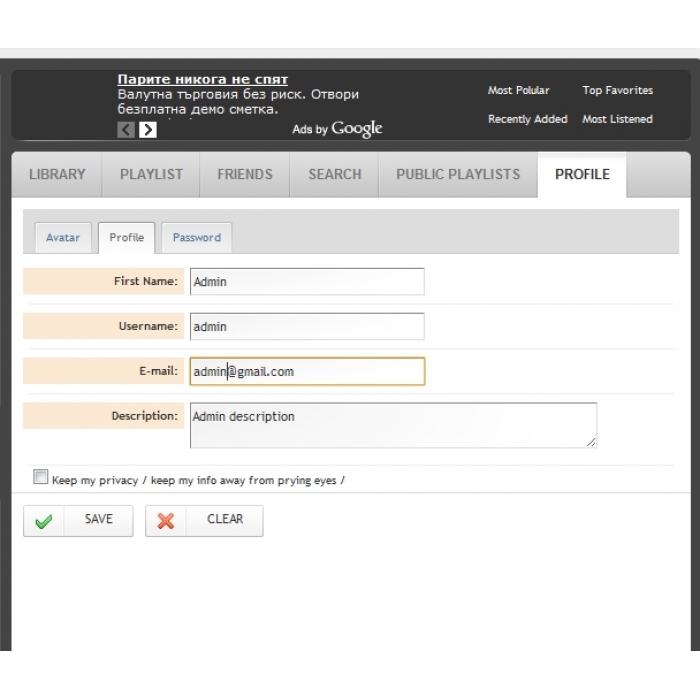 Ability to import play lists from YouTube, Meta Cafe, iTunes Library or other RSS compatible feeds. Now you can have everything in one place. Edit information about each movie clip and create a well-labeled collection. 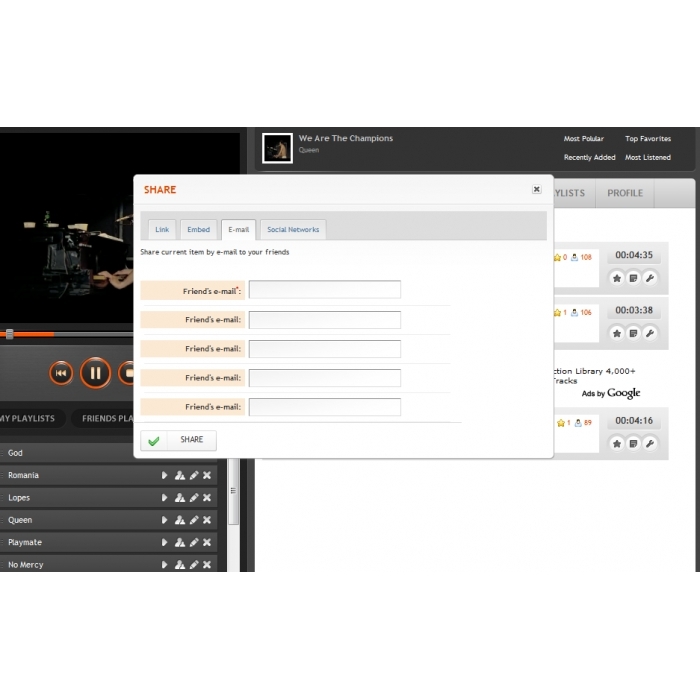 If you need additional info such as artist or album info or even song lyrics, you can it from movie clip menus. 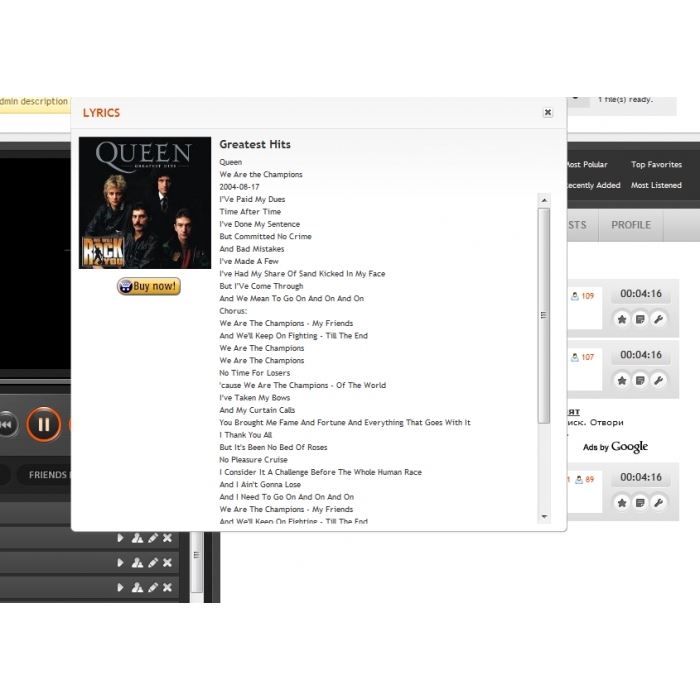 With player's ability to guess strings you can even get lyrics from search results. Buy songs or albums directly from Amazon.com while you read album info or lyrics. There might be other exclusive services in the later player version. Quick rate and share each movie clip. Sharing opens a window with a lot of features such as direct linking, emailing to friends, recommend to other users and the best of all - dozens of social networks and blogs. While sharing offers a lot of choices rate is just simple - do you like the movie clip or not and you can cast your vote by a click on movie clip rate menu. 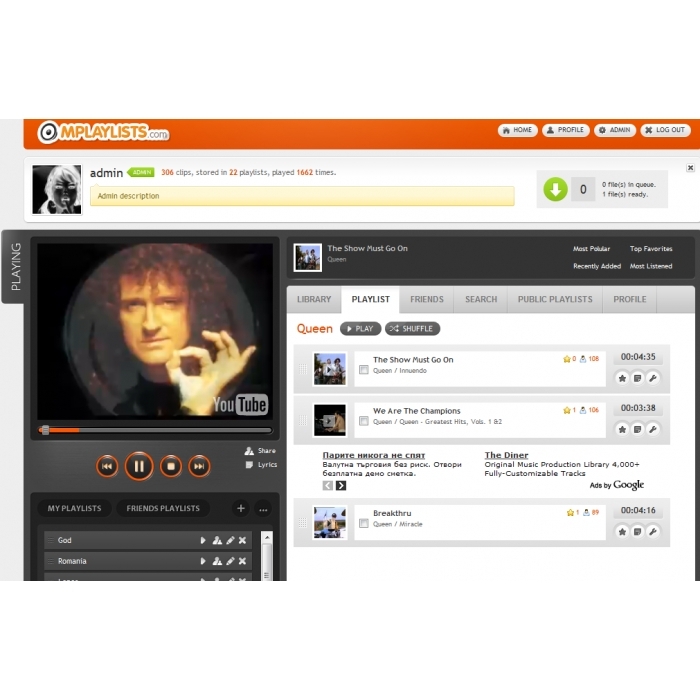 Explore users and their public play lists. Have fun while digging in a countless information. 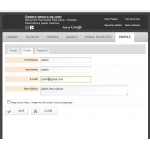 Manage Users - it is good to have a control over your users such as create new, remove and edit. 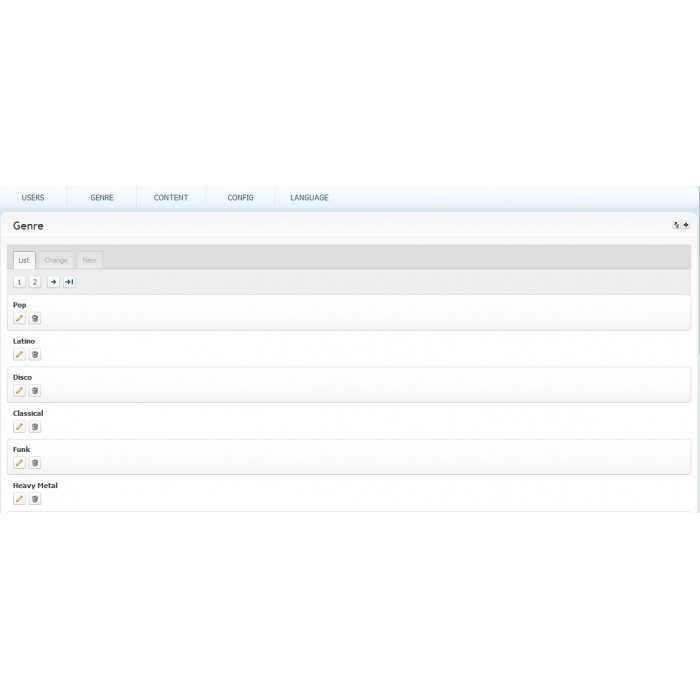 Manage Genres - genres which is used in the site can be controlled from here. Genres help users to better sort the movie clips they have. 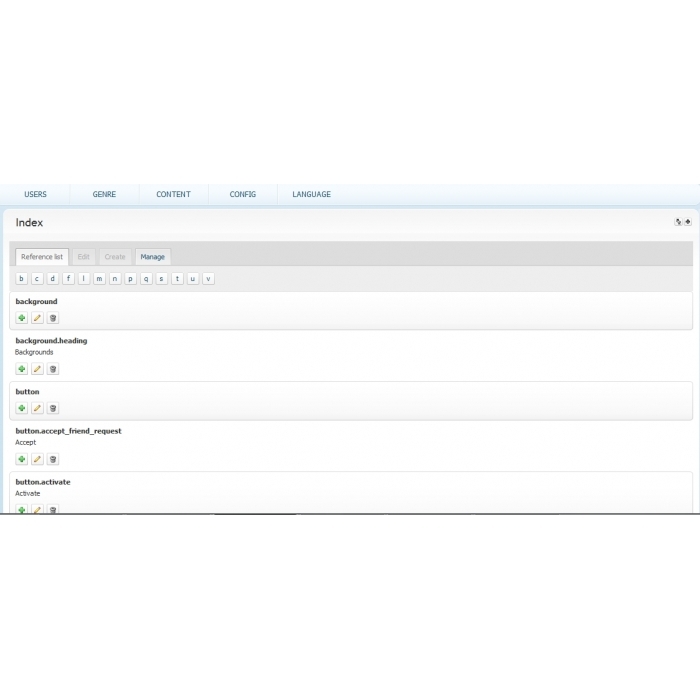 Site configuration - let you to control some site settings such as number of results per page or administrator's email. Language references - site can be translated into different languages and here is the base with every message in the site which can be manipulated on the fly without any special files to change or site edits to do.